Three Republican members of Cincinnati City Council have requested a special meeting to review the Cincinnati Streetcar project, in order to get further clarification from city administrators about the project in its revised form. Council members Charlie Winburn, Wayne Lippert and Amy Murray have requested the meeting. Despite previous opposition to the original plan, the council members now want clarification on the new route that will not initially connect Downtown and Uptown. Lippert admitted that the original plan had great economic implications, and is now voicing concerns about the reduced route. This new view contradicts other Republican members of Council who expressed their doubts about the original plan’s economic impact. At a press conference last week, Mayor Mallory emphasized that the revised version of the streetcar route is a phased implementation, with the line reverting back to its original state once there is more funding in place. The governor’s office pulled all state funding for the project, and even this week the federal government passed over Ohio when reallocating two billion dollars from another high speed rail project. This move was presumably due to Kasich returning money for the 3C Corridor project at the beginning of 2011. The meeting will be held at 6pm in Council Chambers at City Hall (map). There will be an open comment period, and any available streetcar supporters are strongly encouraged to come early, fill out a comment card, and give a short, prepared statement explaining why they are in favor of the project. 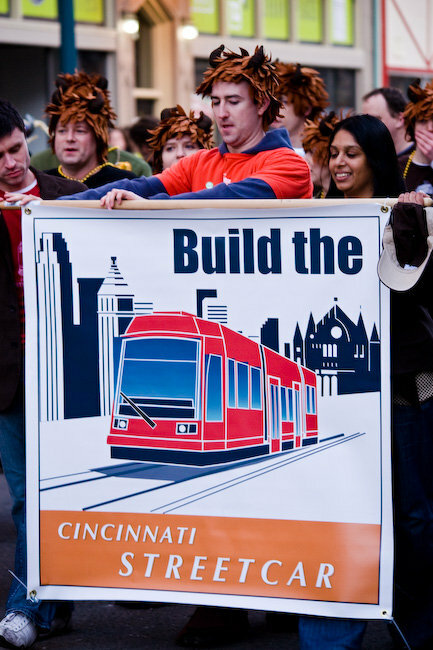 Streetcar supporters march in the 2010 Bockfest Parade. Photo by Sherman Cahal.